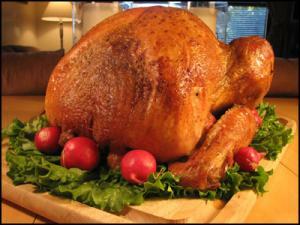 This is a wonderful brine to use for your Thanksgiving turkey or anytime you are roasting a bird. Once you have brined a bird - you will will be hooked! It enhances the flavor of the bird subtley and makes it so moist! Combine all of the ingredients with 1 1/2 gallons of water and bring to a boil. Simmer for 10 minutes and then remove the brine from the heat and allow to cool. Once cooled to room temprature place it in the fridge. Once the brine is chilled, cover your turkey completely with the brine (if you are doing a very large bird you may need to double the recipe)and soak the bird in the brine 1 hour for each pound. So a 12lb turkey would soak in the bine for 12 hours. Remove the turkey from the brine and rinse thouroughly. Now roast the bird as you normally would. Hint: If you don't have room to put a large container in your fridge - toss the turkey and brine in a cooler and just add some ice to keep it cool while it soaks.